It’s that time of year again… time to find that special gift for mi amor. Make that my loves, because I need gifts for the two special guys in my life. I think harder about Valentines gifts then I do most other gifts (except birthday gifts). I think they should be more personal. I do aim for something on the romantic side for my husband. Now, that may be something that wouldn’t seem so romantic to someone else, but believe me my hubby would find it romantic. I can’t say what I have in mind for him this year, because my husband IS a romantic, and reads my blog every day (I find it very sweet), so mums the word. Sorry dear. This would be a good time to drop hints about what I would like for Valentine’s Day… hmmmm, I just want you to be happy. True story. Okay, back to gift buying. More specifically — how to save money on Valentine’s Day shopping. It’s easy to get carried away shopping for your Valentine. They’re probably one of, if not “the” most important loves of our lives, so it easy to spend a lot on them. Or, wish you could spend a lot on them. As much as I love my sweetheart and my little sweetheart (my son), I’m, well… frugal. Don’t mistake this for “cheap”. Although that’s not always bad. And I love free! Free is the best! Frugal just means I’m not wasteful and I have to really need or want something. Then, I’ll shop around for the best price. It’s the competitive side of me — a challenge to see if I can find a better deal. If I’m ordering something online, I really like getting free shipping coupons. It makes a big difference whether I order it online or go to a physical brick and mortar store to make my purchase. I find that I shop more and more online. It’s easier and quicker, and saves on gas money. Add to that if I can find coupon codes, I usually can save money by shopping online. Speaking of “free”, I have a great giveaway for my Blog by Donna readers, thanks to Rather-Be-Shopping.com! They are giving one lucky person $500 cash, via PayPal. 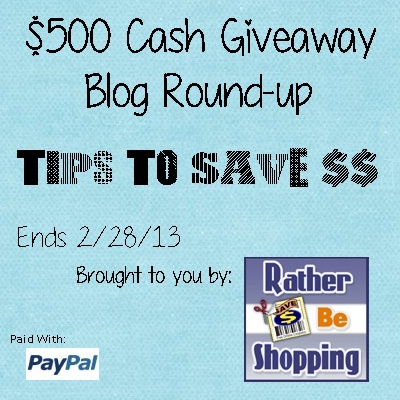 Yes, you heard correctly — $500 CASH! Giveaway ends 2/28/13. Open Worldwide. Enter on the Rafflecopter form below. I have my fingers crossed one of YOU, my blog readers wins! Good luck! Disclosure: Blog by Donna was not compensated for this post, and is not responsible for prize fulfillment.